« Well, THAT was random! Okay, so maybe I’m taking some liberties with assuming they would be his favorite socks. Kind of tempting to make some and mail them to Johnny Depp and Orlando Bloom, though, just to see how grateful they would be for fabulous handknit socks… Where was I? Oh yeah, the Pirate Socks: Materials: MC – Lorna’s Laces Shepherd Sock in Black Purl – 2 skeins CC1 – Knit Picks Essential in Black – less than 1 skein CC2 – Patons Kroy Sock in Muslin – less than 1 skein Size US2 needles (or size needed for gauge)- I use the 2-circ method, but if you prefer DPNs or Magic Loop, go for it! Size C crochet hook Waste yarn for provisional cast-on Gauge: 28sts=4″ in Stockinette stitch Short-row Toe: Using crochet hook and waste yarn, cast 32 stitches onto needle. Change to MC and knit across all stitches. Then, following the great Short-Row Toe instructions here, work short rows until you have 8 live stitches in the middle, and 12 wrapped stitches on either side. At this point, go on to the “Now work the second half of the toe” section of the instructions until your toe is complete. Foot: Once you have the toe complete and have placed your provisional cast-on back on your needles, work one round with CC1, and then switch to the MC. Work in the MC in stockinette until the sock is about 2″ shorter then the intended wearer’s foot. Heel: Change to CC1 again, and work the short-row heel exactly the same way you worked the toe, leaving the instep stitches on a holder or another needle. Cuff: Once the heel is complete, change back to the MC and work 5 rounds in stockinette. Join CC2 and work the pirate motif chart. Be sure to keep the floats nice and loose so that the cuff will stretch over a heel. 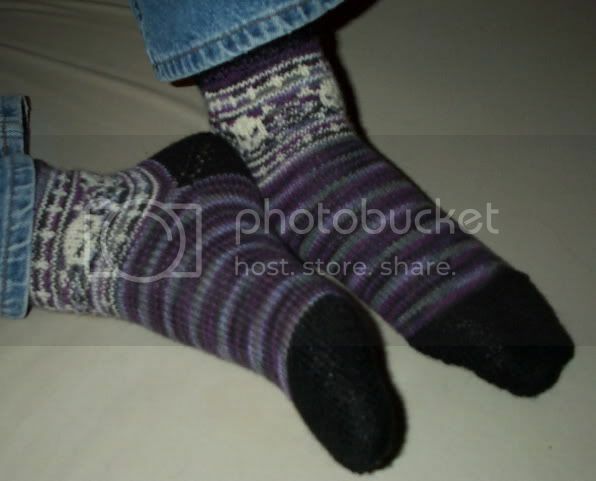 The entire chart will repeat twice around the top of the sock. Once the chart is complete, work another 5 rounds in stockinette in the MC. Change to CC1 and work 5 rounds of K2P2 rib. Bind off loosely. (I like EZ’s sewn bind off, personally. Loose, but not sloppy.) Repeat for second sock, unless you are like me and do both at once. Now, go sail the high seas and plunder a village or two! 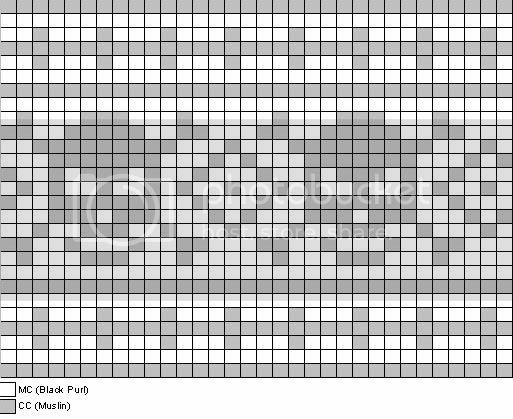 Pirate motif chart: (Adapted from the “We Call Them Pirates” hat pattern at helloyarn.com) ETA: Wow. I was checking my stats, and apparently this is now linked from Knitting Pattern Central. So, if that’s how you found it, HI! And if you make them, please come back and leave a comment with a link to pictures – I’d love to see them! ETA Again – The sidebar has been updated with .pdf versions of my patterns – easier to print! OMG I MUST HAVE A PAIR OF THESE! So flippin’ sweet! You really did a FAB job on these – and FAST! Hey! I live in the same area you do! Are you part of a knitting group? I am casting on tonight as my housemate wants a pair for his birthday. I will be using Lorna’s Laces Camoflauge (mc), natural (cc2) and Opal Uni Brown (cc1). will send u link to pics when done. I’m so excited this pattern was posted! I saw them somewhere online and had to find them, so I googled them and it brought me here! I’m new to the sock knitting venture, but I’m so excited to try these! and thanks for sharing the chart! I’ve just cast-on — my first crochet EVER! (Thank you, youtube.) What I don’t know is the size: is the pattern built for your average woman, or my dad? How do I adapt them for a bigger size? I’ve never knitted socks before. Perhaps biting off more than I can chew?